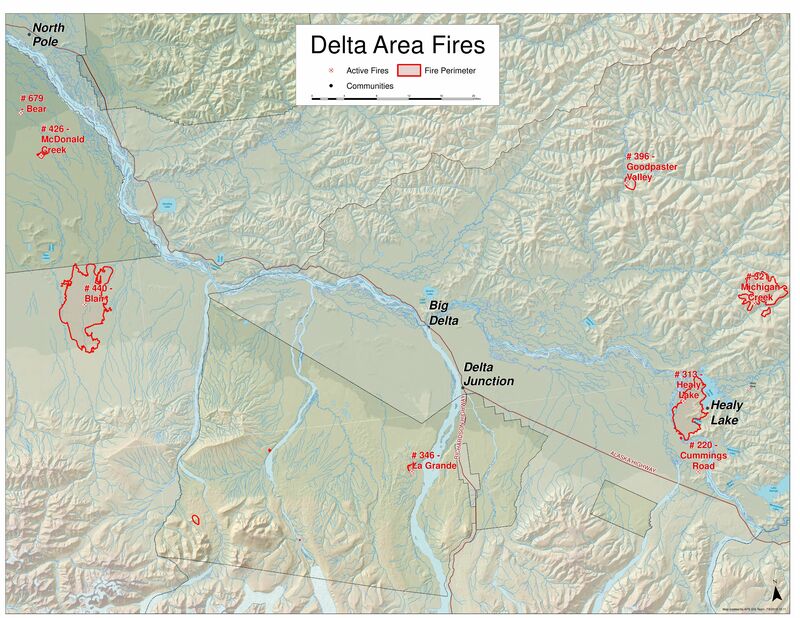 Overview: The Alaska Division of Forestry and The Alaska Fire Service are managing numerous fires around the Delta Junction area. Information for all the fires in the area will be managed out of the Healy Lake Incident Command Post located at the Delta High School. Fire updates will be produced and disseminated as fire activity warrants. Please contact Celeste Prescott at the number above for information on Delta area fires. 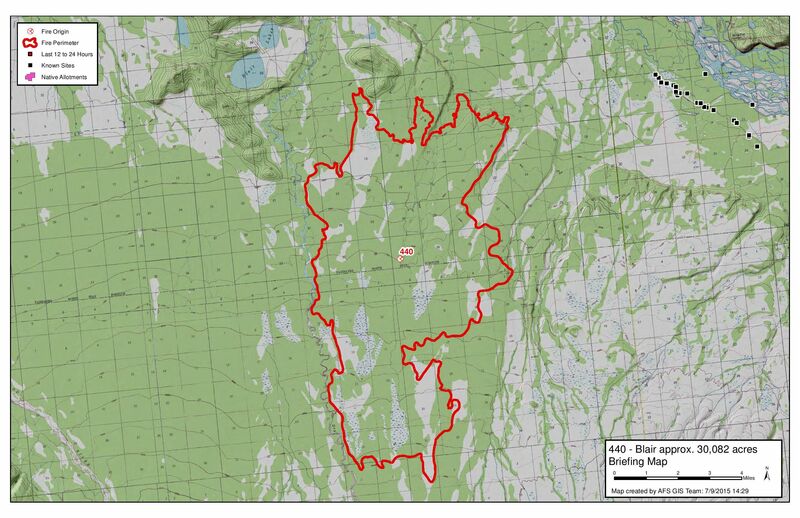 Michigan Creek DOF: The Michigan Creek Fire started on June 17, approximately 38 miles northeast of Delta Junction. The fire is remains at 9,637 acres. Fire activity has moderated with the return of cooler temperatures and higher humidity. Primary concerns are the culture and historic sites to the southwest. Division of Forestry personnel will continue aerial monitoring daily. Healy Lake, DOF: DOF The lightning-caused Healy Lake Fire started on June 16, approximately 28 miles southeast of Delta Junction. The fire remains at 10,443 acres with 63% containment. Division of Forestry personnel is monitoring the fire perimeter daily by air. Additional personnel are gridding for hot spots and prepping for rehab of the southwest portion near Cummings airstrip. About 60 personnel are assigned to various positions on the Michigan Creek and Healy Lake fires. Blair, AFS: The Blair Fire was started by lightning on June 20 and has grown to 30,082 acres. Structure protection in the 5-mile Clear Creek community has been completed. The fire recently advanced towards Dry Creek but has held on the east side of the creek. The Unaweep Wildland Fire Module remains in place near the 5-mile Clear Creek community. La Grande, AFS: Minimal fire behavior has been observed on the La Grande fire. Structure protection remains in place. If fire behavior increases then the fire will be staffed again and structure protection implemented. Goodpaster Valley, DOF: Forestry personnel were unable to fly the Goodpaster Valley Fire due to incremental weather and smoke. The fire will be monitored by air as the weather permits. Smoke Concerns: Smoke is currently impacting portions of central and eastern Alaska. Drive with your headlights on when traveling through areas affected by smoke. For air quality advisories visit, http://dec.alaska.gov/Applications/Air/airtoolsweb/Advisories. Statewide Fire Info For information about fires statewide visit http://www.akfireinfo.com or call the Alaska Interagency Information Center at 907-356-5511.